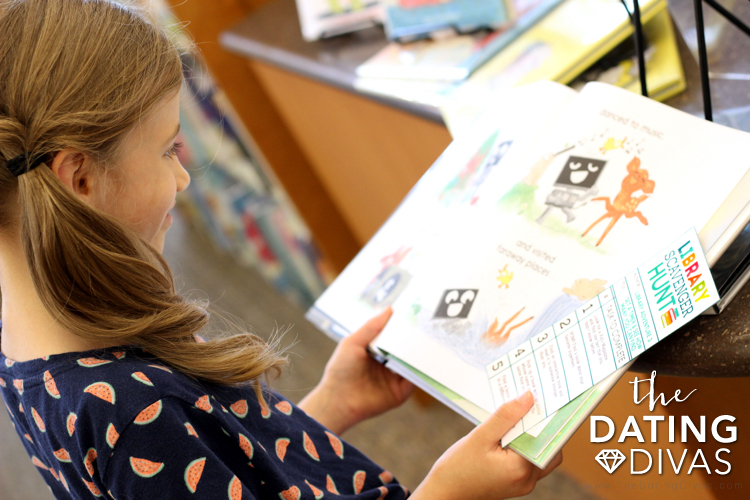 One of our favorite activities is to head to the library and pick out a few books to bring home and enjoy! We love checking out library books and snuggling up to read a new adventure together. Usually, when we make a trip to the library, I’m in a hurry and it’s just another stop on my errands. The library can be a quick and easy stop! Go in, pick out a few books and go home! But I’ve noticed the kids are always a little bummed to rush in and out. They long to explore and spend more time in the library! 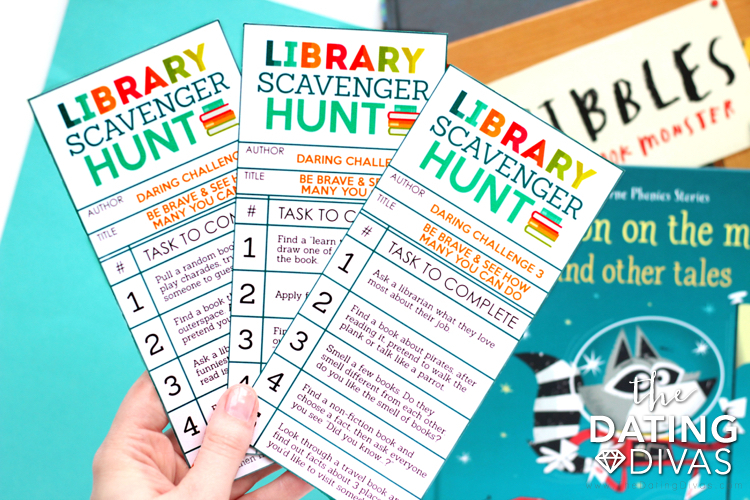 We decided to put together a library scavenger hunt to help capture the magic of the library and get kids excited to discover all different kinds of books! 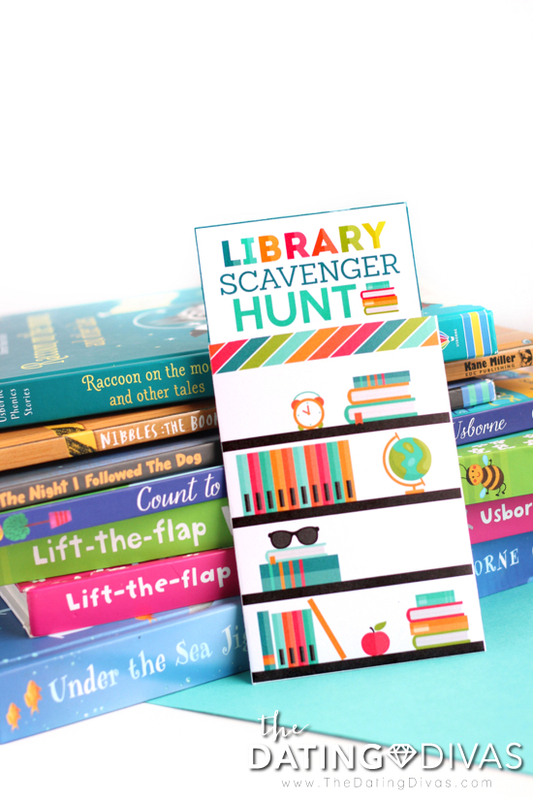 Your kids will love this library books scavenger hunt!! 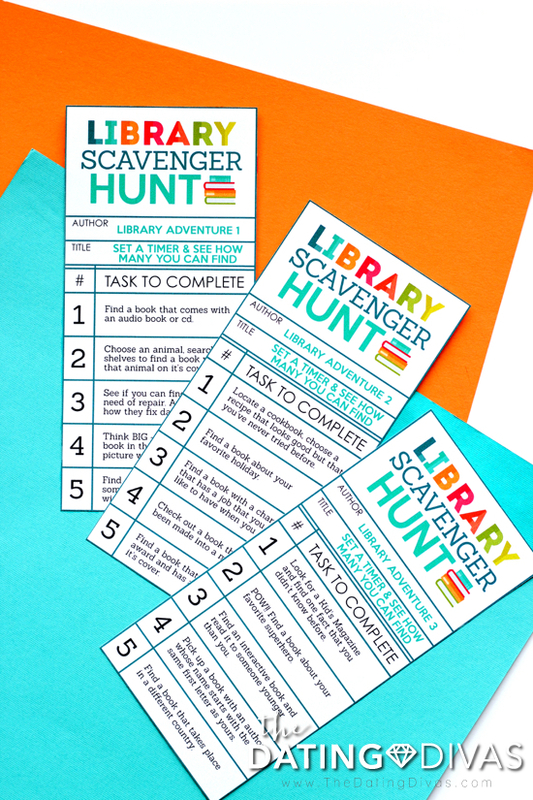 These fun Library Book Scavenger Hunt printables were designed by Messes to Memories! They are absolutely perfect for kids. Isn’t that so fun? 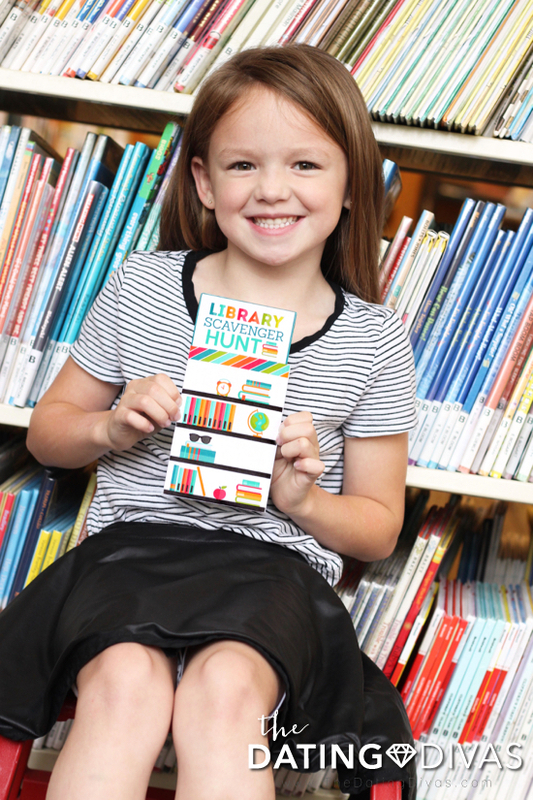 My daughter’s first reaction when she saw the little pocket holder for the Library Books Scavenger Hunt cards was a little squeal of excitement! 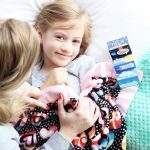 Each of the cards has 5 tasks with fun and unique books to find… this is a sure-fire way to help your kids find some books they’ll be excited to read! The skills learned by reading are priceless and we all want our kids to be successful readers. The best way to become a better reader is to read more. The best way to get kids excited about reading and books is to expose them to a lot of books. 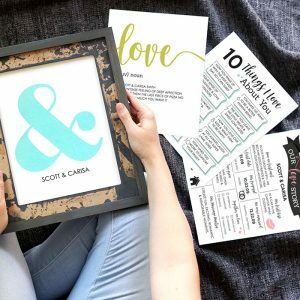 These fun Scavenger Hunts get kids looking through so many different types of books. 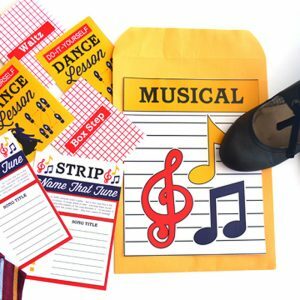 This is really such a fun way to help kids discover new adventures—they won’t even realize how much they are learning with this fun library activity! 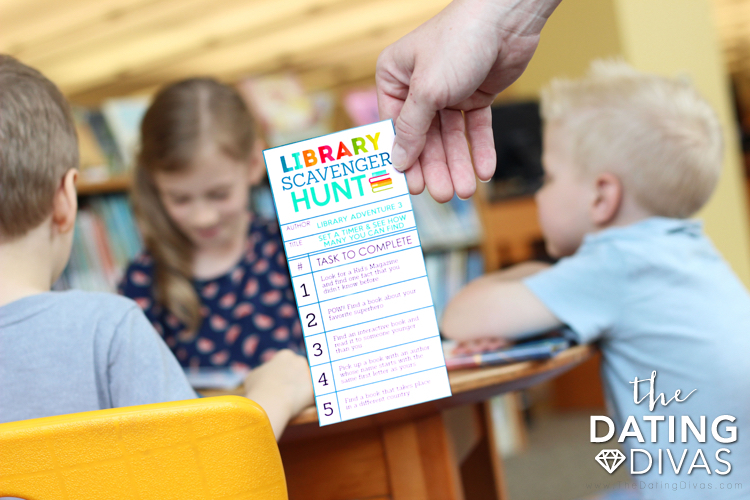 We’ve created 6 library books scavenger hunts so you can make several fun trips to the library and enjoy exploring different parts of it every time. 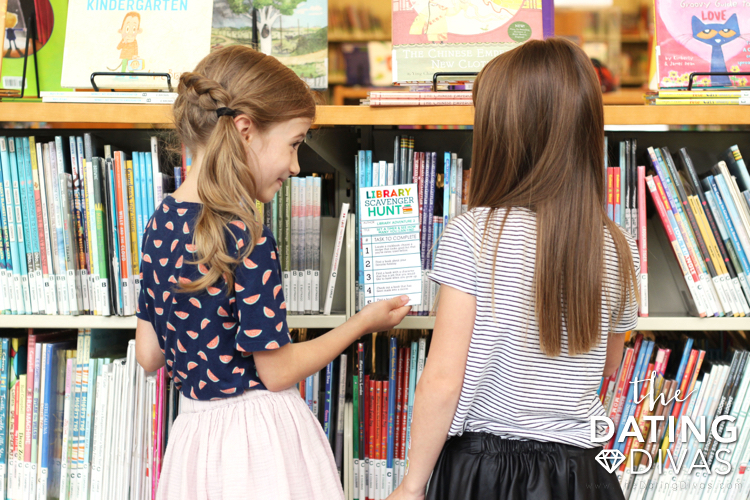 The first Library Books Scavenger Hunt simply helps kids find different types of books; some that they might not normally look for at the library. These are the search and find scavenger hunts. 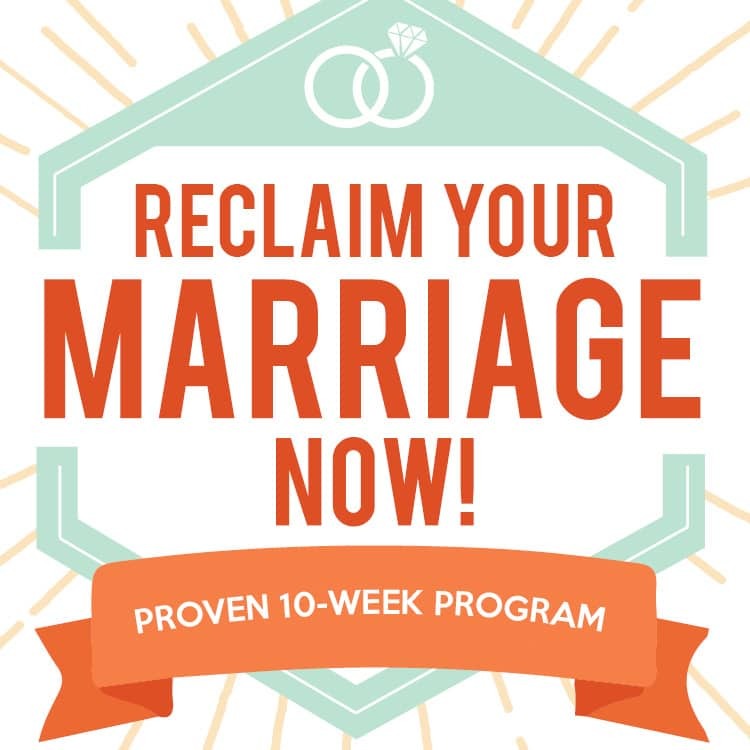 See if you can find a book in need of repair. Ask a librarian how they fix damaged books. Think BIG – find the largest book in the library and take a picture with it! Find a book that explains how something works (a car, a windmill, a volcano). Find a book with a character that has a job that you would like to have when you grow up. Locate a cookbook, choose a recipe that looks good but that you’ve never tried before. Look for a Kid’s Magazine and find one fact that you didn’t know before. POW!! Find a book about your favorite superhero. 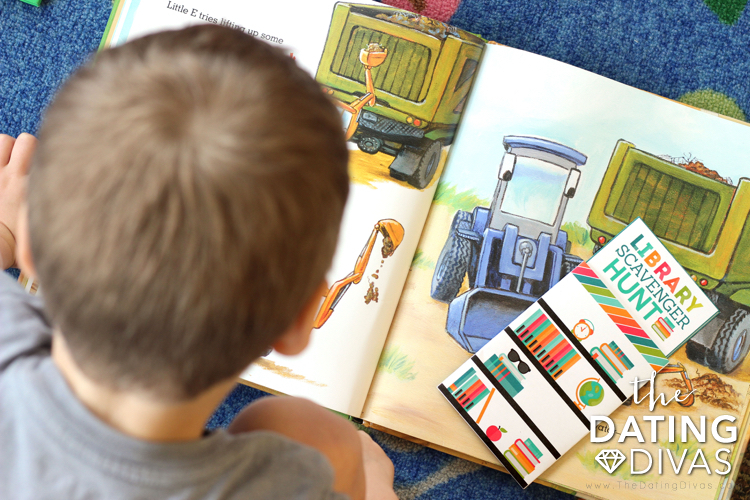 Find an interactive book and read it to someone younger than you. You might have to point younger kids (ages 5-7) in the right direction from time to time. But for older kids (ages 8-12), we suggest setting a timer to see how fast they can find everything. Make it exciting! The second type of Library Books Hunt has more challenging tasks, kids will have to find books and then complete an action of some kind! 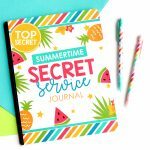 These are definitely better for older kids and will probably be so fun you’ll want to do them again and again! 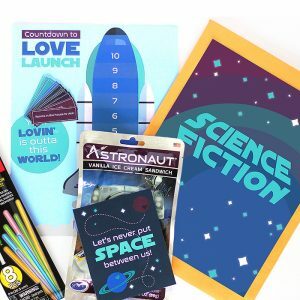 Find a book that takes place in outer space. After reading it, pretend you’re moonwalking. Find a non-fiction book about your favorite animal. Then play 20 questions with someone. 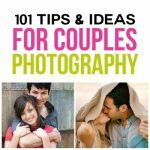 Find a “learn to draw” book and draw one of the pictures from the book. Smell a few books. Do they smell different from each other? Do you like the smell of books? Look through a travel book and find out facts about 3 places you’d like to visit someday. Find a comic book and read it out loud, including the dramatic “Pow” and “Wham” parts. Ask a librarian what they love most about their job. I love how so many of these challenges get kids to do things they probably never would under any other circumstance. I also love that they could possibly get shy kids to be a bit more brave! There are so many fun things to do at the library! We’ve included a list with a bunch of ideas to help you get the most out of your trips to the library. Cuddle up and read a book. Participate in a reading program or challenge. Use toys, puzzles, or other educational toys provided by the library. Research a subject that you’re interested in. Find something new to learn about. Have a picnic outside the library. Buy old, worn out books. Reading is dreaming with eyes wide open! 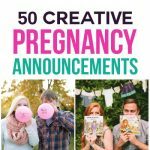 Want to join in on the fun? Check out our Library Date Night, it is one of our most popular date nights and will get you and your spouse exploring the library too! 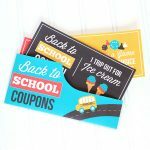 We know parents are always looking for ways to keep their kids busy and engaged. 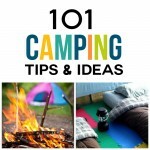 We've put together 101 Things to Do with Kids BESIDES Watching TV. This is SO cute! We go to the library once a week, this will make at least one of trips even better! 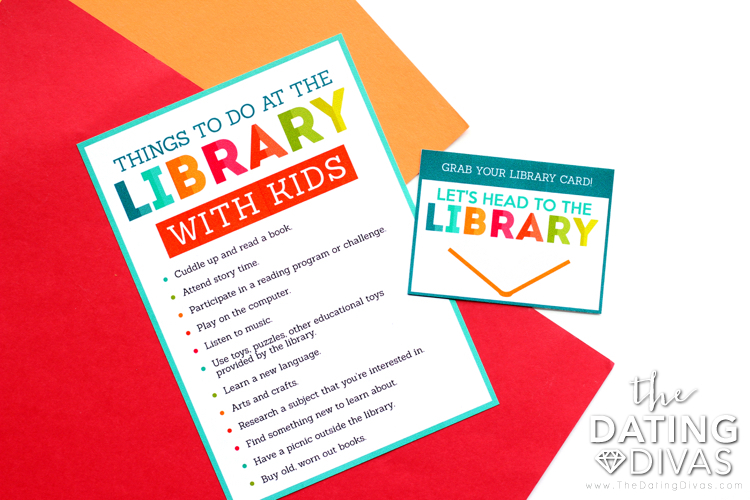 My kids are major library lovers- this is perfect for them! This is SO awesome!! I can’t wait to do this with my little guy when he is a bit older. I love what you did with this! 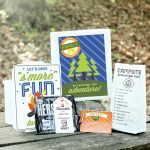 So many fun options!